The home is the hub of all connection points. Work, Home, Play, School, Relationships….its the melting pot where all connections come together. It is understandable the home can be the messiest area of all, to keep it together. The number of people in a home drastically increases the number of connections points. Large families naturally have many more connection points than smaller families. Add in a pet or two – well hold on for a wild ride. A home requires the basic type of goal setting as a work, environment and then some. A common goal is critical for a home to function. With a common goal, all members can see what the goal is and more easily understand their role in contributing to the end result. 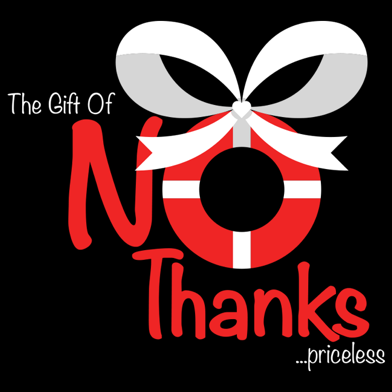 Throw in all the various personalities and idiosyncrasies and well – there is no shortage of needing to say “NO Thanks” – frequently. Everyday events like getting out the door to school or work on time can be filled with great challenges. The value of saying “NO Thanks” to taking on extra chaos is priceless. Kids needing paperwork signed 60 seconds before a parent is ready to leave for work…or a kid needing a check for baseball pictures that must be turned in “TODAY” does create chaos -major chaos. However, we can say “NO Thanks” to a bad attitude and embrace this chaos and commit to not let these unexpected situations ruin your day. Kids should come with a warning label to “expect the unexpected – always” because it will come, surely and often. When my oldest son was 16 years old he needed a check for baseball pictures – at the very minute I was walking out the door for work…but he didn’t know the amount needed for the check and he said I could just sign him a “blank check” and he would fill in the amount. Against all my best judgement, and in the rush of the morning, I agreed to his plan. Later that day I get a call from him that five other baseball teammates had forgot their money and he asked if he could use my “blank check” to cover for his team mates too. Heart stop as I remind myself to breathe. My son and his coach assured me the other five boys would bring their money the following day. After my heart skipped a few beats and I took a few breaths, I agreed and the following day all five guys brought their money to my son for their share of the pictures. Thankfully, I had said “NO Thanks” to fear with my “Blank Check” that day and I am so grateful I trusted my son and all his buddies and allowed them to honor their commitment. Priceless.